Three-Sided Changing Pad Discounts Apply ! 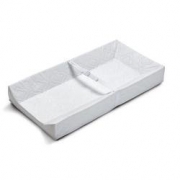 The three-sided changing pad is a great way to make any place safe and convenient to change diapers. Double-layered vinyl makes it a breeze to clean, too. Ultra Plush Changing Pad Covers are also available in a variety of colors.